More good news for the Tories (or more job for them to dismiss the polls in the medias). After the Ekos poll showing a big lead for the Conservatives, we now have some kind of confirmation with the latest Ipsos poll showing a very similar lead. Those projections use those two polls. Here are some comments. [update for the Harris-Decima poll]: 10 points lead for the Conservatives, but the NDP lower in this poll. If I use this poll along with the other two, it gives me: CPC 145, LPC 75, NDP 32, 0 Green (but two races now, including one in BC where HD puts this party really high) and 52 Bloc. The same story remains true though, with the CPC now in reach of a potential majority. Btw, funny to see that Ipsos has the NDP at 30% in BC, while HD has this party at only 19%. 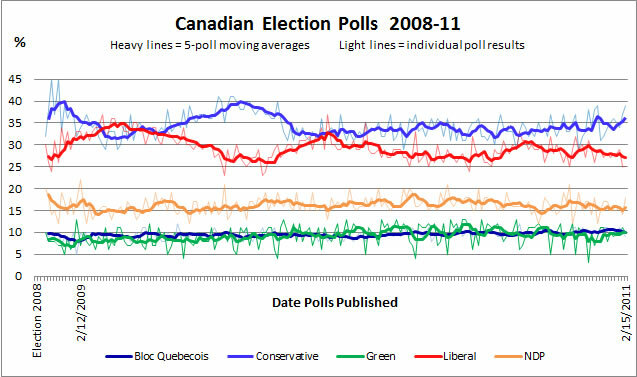 I know this is the margin of error, but it shows the importance of averaging polls, especially at the province-level. While not in the "majority territory", the Tories are getting incredibly close. In particular, if you sum the safe wins (more than 5% margin) and the potentials (within 5% of the leader or leading by less than 5%), you have this party ata max of 162! Of course, for a majority, they would need to win approx. 70% of the close races. This would be a really, really high conversion rate. 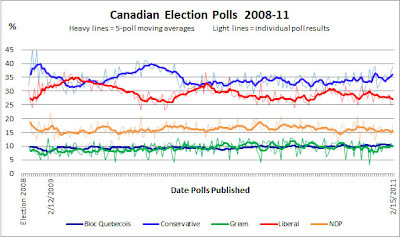 But let's not miss the big picture here: the polls are really positive for the CPC and really bad for the Liberals. And this is BEFORE being in an actual election. I think it might be important. Let's look at what happenned at the beginning of the last election. The source is the SFU study group on elections. Ok more comments. The Liberals are low everywhere in those two polls. Ipsos is hard on them even in the Atlantic! If I were to use only this poll, the Liberals would hit a low of 67 seats! With those numbers, I really wonder if this party will vote against the budget or not. Ok let's talk a little bit about the NDP. My competitor (308) always projects this party to be really, really low. On the other hand, DemocraticSpace (not active at the moment though) or myself consistently project this party at around 30 seats or more. Why this difference? Well many things. First of all, even by using simple models such as a uniform-swing model (which, if you read my methodology, is less efficient than my model but still gives a good idea of the overall results), you also get the NDP at more than 30 seats. 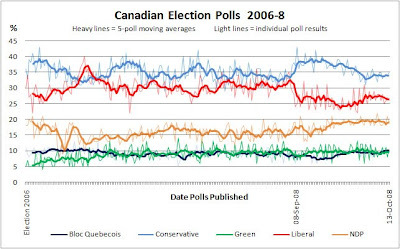 All that to say that the NDP at 17% today is not the same as the NDP at 17% in 2004. Things have changed, the NDP votes is more concentrated. This is something that 308, without a proper model at the riding-level, cannot take into account. Secondly, yes the NDP is lower in the votes intentions, but who benefits from this? Not the Liberals, and this is the key here. The party stealing most of the votes is the Green party. And because, as I showed here, the NDP became much more efficient in his votes, this party can afford to lose some votes to the Green. It isn't costing them actual seats, yet. It would be another story if those votes were going to the Liberals. Especially in BC and Ontario. At the end, I believe 308 underestimate the NDP and I overestime it. So just do an average of both. The Greens are still projected at one seat, in Ontario. But we all know they are overestimated in the polls. So we'll have to wait and see. Finally, not a lot to say about the Bloc. They are still below 40%, but because the federalist parties are almost evenly split, they manage to gain a lot of seats. The riding-by-riding projections are available here. Don't forget to let me know about the changes for the Atlantic provinces. This Monday, the Hill Time online was showing how very few ridings are consistently what we call a close race, i.e: where the winner has a lead of less than 5% over the opponent(s). This is interesting but I do feel it's only half the story. Of course, it makes sense that a close race last election won't necessarily be one this time around. The main reason? Parties' levels of support change between election. So if a riding was a close race in 2006 in Ontario between the Conservatives and the Liberals when those parties were at respectively 35.1% and 39.9%, it's only logical that the race is over when the same two parties now stand at 39.2% and 33.8%. Nevertheless, I do think the Hill Time is too quick on dismissing the importance of being a close second during an election. I think what we should really be looking at is whether those close races changed colour the next election. So here are some table for the 2004 to 2008 elections. 2004 close races close win kept in 2006 close in 04, win in 06 net diff. A couple of interesting things here. 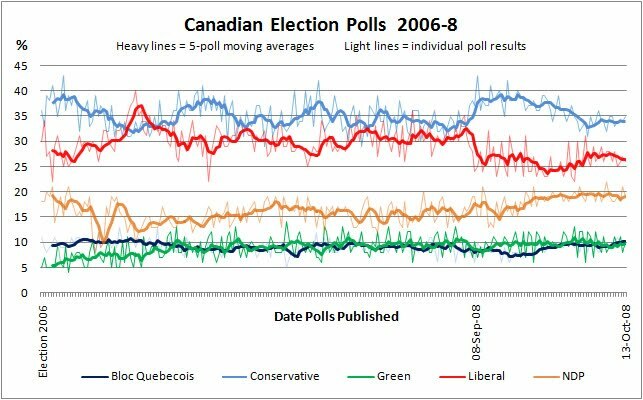 First of all, notice how inefficient the NDP votes was back in 2004. High enough to put this party in the race in 22 ridings, but only 7 wins? That's a really low rate of convertion. It seems that over the year, the NDP has become much more efficient and that alone could explain why the NDP can actually lose some percentages but actually win more seats (kinda like in BC or Ontario). Second of all, the Liberals just got destroyed the last two elections. Their losses in previously hot races are huge. By simply looking at those losses, we cna explain 27 out of the 58 seats lost between 2004 and 2008. If you ask me, this is significant. It shows that a lot of the action is actually happening in those close races. That can also help explaing the rise of the Conservatives. Let's just look at 2008. Out of the 33 ridings where the Conservatives were in the race in 2006, they won 28 of them in 2008! On the other hand, for the Liberals, the numbers are 10 for 44. Don't tell me this didn't have a massive impact of the victory of the Tories. So to sum up, I agree that being a close race in one election is not necessarily a good predictor of whether this riding will be a hot race next time. But those close races are important and should be watched closely because they are the sources of a lot of the action/changes. Moreover, looking at how the Conservatives are slighlty but surely grabbing more of those previously close races, I wouldn't be surprised if they actually manage to get a majority the next time around. I mean, look at the numbers for 2008. They lost 14 ridings by a margin of less than 5%. With a good riding targeting, this party won't even need to increase its level of support substantially to win this majority. But this is another story.